The ScrapeBox Redirect Checker is a free addon included with the purchase of ScrapeBox. It allows you to load a list of Domains or URL’s and scan them to locate the destination URL of all pages that redirect. The addon displays the Source URL you have loaded, and next to it the Destination URL that the source redirects to. It also allows you to view the number of redirects that occurred before arriving at the destination URL, as well as the type of redirect such as a 301 Permanent Redirect, a 302 Temporary Redirect or a Meta Redirect. Once the addon has run, you can right click any of the URL’s to view them in your default browser. You can also filter the results and remove any error URL’s or remove any URL’s which do not redirect. You can export all columns (Source URL, Destination URL, Redirect Count, Redirect Code and Status) as an .xlsx file for viewing in Excel. Or all the destination URL’s can be exported as a .txt file for use in ScrapeBox or other applications. 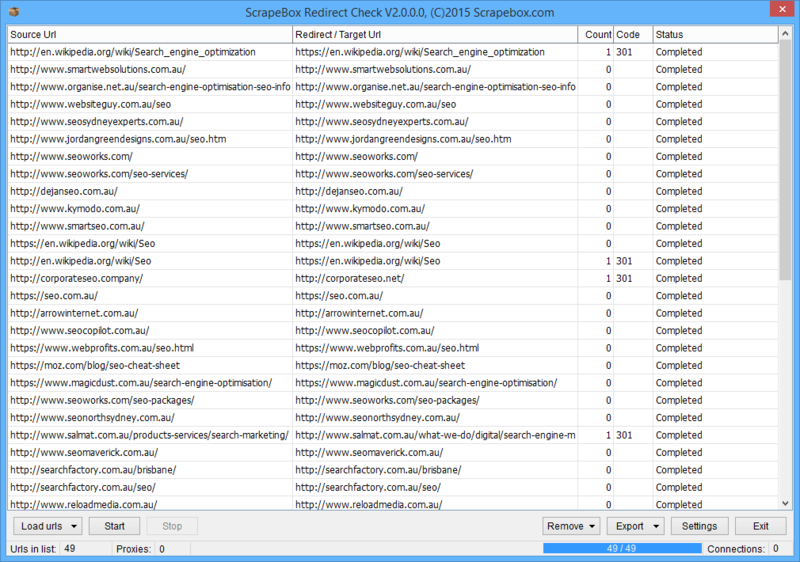 The ScrapeBox Redirect Checker addon is multi-threaded, allowing up to 500 simultaneous connections, it also has support for the use of proxies as well as being compatible with the ScrapeBox Automator Plugin. View our video tutorial showing the Redirect Checker Addon in action. This is a free addon included with ScrapeBox, and is also compatible with our Automator Plugin.